terrorism | Get Off My Lawn!! Chris Bevington, an executive at Spotify, was among the victims killed in Friday’s truck attack in Stockholm, the streaming service’s founder, Daniel Ek, confirmed with a Facebook post on Sunday. “It is with shock and a heavy heart that I can confirm that Chris Bevington from our Spotify team lost his life in Friday’s senseless attack on Stockholm,” Ek wrote. Bevington had worked with the company for five years, Ek noted in the post. The British 41-year-old had served as Spotify’s director of global partnerships/business development, working from Stockholm. On Friday, four people were killed and about 15 more were injured when a truck plowed through a shopping area in the heart of Sweden’s capital. According to CNN, a suspect — a 39-year-old man from Uzbekistan — was arrested hours after the attack on suspicion of terrorism offenses. A second suspect was also reportedly placed under arrest on Sunday in connection with the attack. In addition to Bevington, the victims were identified as a Belgian and two Swedes, one of which was an 11-year-old girl, according to the Guardian. The FBI has told members of the LGBT community it will pursue accounts that the Orlando nightclub shooter was partially motivated by internal conflict over his own sexuality, the Guardian has learned. A conference call held late Monday pulled together representatives from the FBI and departments of justice and homeland security with 358 civil-rights-minded leaders, particularly from the LGBT and American Muslim groups, a senior US official told the Guardian, to share information and hear concerns from communities reeling from one of the worst incidents of gun violence in recent US history. FBI officials on the call “indicated they would follow up” on reports that shooter Omar Mateen had on a number of occasions visited the LGBT nightclub Pulse where he killed 49 and wounded 52 on Sunday. That focus is thus far unprecedented in nearly 15 years of post-9/11 counterterrorism, which has yet to confront a known case of a suspected closeted LGBT individual ostensibly committing a mass murder in the name of a homophobic terrorist organization. According to a readout of the call, the Department of Homeland Security also said it was receiving “reports of anecdotal backlash from Muslim-American, Sikh, South Asian and Arab-American communities”. The US official said that on the call, Muslim leaders expressed “condolences and significant support” for LGBT communities in Orlando and beyond. As the FBI continued to sift through evidence on Tuesday, Mateen’s second wife told investigators she attempted to dissuade his Sunday attack on revelers at Pulse, according to NBC. In a statement in Washington, Barack Obama said there was as of yet no indication that Mateen had any ties or support from any terrorist group. Officials close to the investigation note that unlike traveling to Iraq or Syria, there is no barrier to claiming inspiration from Isis, even as a pretext. Disentangling Mateen’s motivations, at this point a major focus of the inquiry, is likely to be a complicated task, one that does not resemble the straightforward ideological drivers familiar to years of terror inquiries. The FBI described the Orlando attack as an act of terrorism by midday Sunday, an unusually rapid assessment. Evidence supporting the claim came from a 911 phone call Mateen placed in which he declared allegiance to Isis, and because the FBI had previously interviewed him on three occasions in 2013 and 2014. The bureau had even watch-listed him for much of 2013 but ultimately determined any connection to terror was insubstantial and did not consider him a threat. New information has complicated that initial assessment. Several attendees of the Pulse nightclub have said Mateen was a frequent, often belligerent, presence. “He was a homosexual and he was trying to pick up men,” one told the Associated Press. A police academy classmate said Mateen had asked him out, and the two attended LGBT clubs together, though he considered Mateen closeted. He was abusive to his former spouse, a woman, was married to another woman at the time of the slayings, and is said to have maintained a profile on an LGBT dating app. Additionally, Mateen’s tenuous terror ties raise questions about his adherence to a virulent religious-based ideology. He had falsely boasted in 2013, and again on the pre-shooting 911 call, of connections to the Boston Marathon bombers. On the 911 call, according to FBI director James Comey, Mateen expressed sympathy with terrorist groups of opposing ideologies and goals, from the Shia Hezbollah to the Salafists Isis and al-Qaida, all of which are at war with one another. He is said to have enrolled in online courses taught by a homophobic imam. In his statement on Tuesday, Obama called Mateen an “angry, disturbed and unstable young man” who absorbed “extremist information and propaganda over the internet”. Homophobia and jihadism are anything but mutually exclusive. Isis executes people it says are gay, stones them and throws them from roofs. But Seamus Hughes, a former congressional homeland-security staffer who studies extremism at George Washington University, said he could not think of a previous known case of a closeted individual committing an act of domestic terrorism after claiming affinity with a jihadist militant group. “It appears to be a unique case, at least in the recent American jihadi context,” Hughes said. Obama, who on Sunday called the mass shooting an “act of terror and an act of hate”, challenged Congress to reinstate the pre-1994 assault weapons ban after conferring with his national security council at the treasury department. “Enough talking about being tough on terrorism. Be tough on terrorism,” Obama said. Obama also ridiculed what he called the “political distraction” that using the nebulous phrase “radical Islam” to describe Isis and related US adversaries would provide counterterrorism advantages. Obama has faced repeated criticism from Republicans, including Trump and other former presidential candidates, over his refusal to identify the threat posed by Isis and other extremist groups as “radical Islam”. “The reason I am careful has nothing to do with political correctness and everything to do with defeating extremism,” an angry Obama said, before calling out Republican presumptive nominee Donald Trump over his proposal for banning on Muslim immigration to the United States. “We are now seeing how dangerous this kind of mindset and this kind of thinking can be,” Obama said. Just days after arresting French-born Belgium national and terror suspect Salah Abdeslam in Brussels, a coordinated terror attack unfolded in the very same city, killing 34 and injuring many more. NBC News has already announced that European officials are linking the attack to ISIS, though it is unclear whether or not Abdeslam’s network – which carried out the November 2015 Paris terror attacks – was directly involved. Police in Brussels were still hunting for several other alleged accomplices of Abdeslam, including Najim Laachraoui and Mohamed Abrini. Laachraoui and Abrini, like virtually every other suspect involved in a string of terrorist attacks across North America, Europe, and Australia, were well known to Western security agencies, having both been documented as having traveled to Syria to fight against Damascus under ISIS, with Abrini having been arrested and jailed several times in the past, and Laachraoui already having a 2014 international arrest warrant issued for him in connection to a trial involving recruiting Europeans to fight for ISIS. Mohamed Abrini, 31, is among Europe’s most wanted fugitives since he was filmed with Abdeslam at a petrol station on a highway to Paris on 11 November aboard a Renault Clio that was used in the attacks two days later. Described as “armed and dangerous” in a European arrested warrant the Belgian-Moroccan is believed to have travelled to Syria after serving short stints in jail for petty crime and robberies. Laachraoui is thought to have studied electro-mechanical engineering at a Catholic high school in Schaerbeek, the Institut de la Sainte-Famille d’helmet, graduating in 2012. He was already known to be in Syria in 2013, and was the subject of an international arrest warrant in 2014. And because Laachraoui’s DNA is alleged to have been found at several scenes linked to the terror network, it appears that he too may have been in custody at least long enough to provide a DNA sample as a reference to now match him to evidence collected in the aftermath of the 2015 Paris attacks. Some reports have said he spent time in prison for robbery where he met suspected ringleader Abdelhamid Abaaoud. He had earlier been sacked as a technician on the Brussels tram system, for missing work. Dutch police said they had detained Salah Abdeslam briefly in February, fining him €70 (£49) for possession of cannabis. In other words, all of the suspects have been under the nose, on the radar, and in the prisons of Western security agencies on and off for years, yet were still able to carry out at least one high profile terrorist attack – possibly two, and with the vast majority of the suspects involved having traveled to Syria to fight alongside ISIS before inexplicably being allowed to re-enter Europe and rejoin society without consequence – as if inviting them to take their extremism to the next level. The Guardian’s “Brussels attack: were they revenge for Abdeslam’s arrest?,” attempted to link the bombings in Brussels to the arrest of Abdeslam and the Paris attack terror network. The op-ed acknowledges that these terrorist attacks are being carried out by locals – Europeans – using local resources. Should the Brussels attack be linked to this same terror network, it will greatly complicate efforts by some to leverage this tragedy to further their agendas against refugees and even to change the dynamics of the war in Syria itself. Europeans are clearly already being radicalized and then leaving to Syria to fight alongside ISIS and then returning – rather than a torrent of foreigners streaming in from abroad and carrying out violence against European targets. Should the Brussels attack turn out to be the work of this ISIS-linked terror group, considering the familiarity European security agencies had with all the suspects long before even the 2015 Paris attacks, indicates criminal negligence at best, and complicity at worst. But even if the attacks are the work of foreign ISIS militants, one should consider the West’s admitted role in the creation and perpetuation of ISIS in the first place. ISIS’ own alleged agenda of transforming the world into a “caliphate” is cartoonishly absurd. In reality, it is clear that ISIS shows up and exercises force in regions of the world the US and its allies cannot intervene in directly. This includes North Africa, the Middle East, and even as far as Asia. Between this admission, and an earlier exposé in 2007 by veteran journalist Seymour Hersh in his New Yorker piece titled, “The Redirection” where US and Saudi plans to use Al Qaeda to wage proxy war on Syria and Iran were revealed, it is clear that both Al Qaeda and ISIS are being used by the West to wage war on Damascus, Baghdad, Tehran, and even Moscow. ISIS supply lines clearly, even admittedly run from NATO territory in Turkey – where the US and its regional allies have categorically failed to interdict them and even appear to be aiding and abetting the flow of men and materiel into ISIS-held territory in Syria and Iraq. These supply lines are what has allowed pressure to be continuously placed upon Damascus and its allies over the past 5 years in ways nonexistent “moderate rebels” couldn’t. In Indonesia, as Jakarta clearly began re-balancing toward Beijing, ISIS carried out its first deadly attack on the Southeast Asian nation. Thailand’s similar re-balancing also prompted threats from the US that an “ISIS attack” was imminent. In Europe, where the flames of a “clash of civilizations” are being furiously and intentionally fanned, ISIS serves as a constant implement to empower extremists on both sides, while drowning out the voices of unity, moderation, and peace in the middle. It allows for a growing police state and xenophobic tendencies to flourish at home, while justifying further war abroad. While some Western newspapers are already trying to frame the Belgium attack as “incompetence” by European security agencies, there must be a better explanation as to why this “war with ISIS” continues to drag on, when the source of ISIS’ fighting capacity appears to be within rather than beyond the West – and aiding rather than opposing Western special interests. The extraordinary steps are now perfectly legal under the state of emergency decreed by the government after the attacks on Nov. 13 in Paris that left 130 dead — a rare kind of mobilization that will continue. The French Parliament last week voted to extend the emergency for another three months, which means more warrantless searches, more interrogations, more people placed under house arrest. There have been 1,072 police searches already, 139 police interrogations, and 117 people have been placed in custody, the Ministry of the Interior said on Monday. Those included a weekend raid on a restaurant selling halal burgers and Tex-Mex food in the Paris suburbs, where officers found nothing suspicious, after breaking down the doors. Many of those being swept up are among the hundreds of French who have already been flagged as potential security threats in the notorious S-files of the security services. The police are now freed to pick up and interrogate suspects virtually at will. Concern is rising, particularly in Muslim communities being singled out, that France now runs the risk of tipping steeply in favor of security at the expense of individual freedoms and of instigating tension with a Muslim population — the largest in Europe — that has already long felt aggrieved and second class. Even critics of the aggressive policing acknowledge that the government must be seen doing something to protect the shaky public. At the same time, though, the critics worry that the drift toward a state where the police have the upper hand has discomfiting echoes in modern French history — the collaboration of the Vichy regime in World War II, for example — and they say authorities must be careful not to give in to panic. “These extrajudicial searches have shot up since the attacks, they are being carried out in haste, and under pressure from public opinion and the political class,” she said. That context, Ms. Jeannerod added, can only encourage human rights abuses and mistakes. Long faces in the capital, more soldiers patrolling landmarks like the Louvre Museum and empty streets speak to the preoccupation with security. Politicians all over the country say their constituents are talking of little else but the slaughter a little over two weeks ago, according to the French media. Amid the continued jitters, the French police said they found a suicide belt on Monday afternoon in a garbage bin in Montrouge, in Paris’s 18th Arrondissement, said a former French intelligence official close to the investigations. The police say that it may have belonged to Salah Abdeslam, who had a role in the Paris attacks, because a cellphone of his had been matched to the location where the suicide belt was found. The former intelligence official also said that the Islamic State had claimed that the 18th Arrondissement was a target, but that an attack never materialized. Mr. Nogueras’s clients are all Muslim, and are in the S-files that register those considered possible threats to the state. Participants in all the major terrorist attacks in France this year were in the S-files, too, including those in the attacks on Nov. 13. But Mr. Nogueras says his clients, under the house-arrest procedure, are shouldering an intolerable burden that they do not deserve. Simple attendance at a mosque under surveillance can land you in the S-files, he noted. The result has been a catastrophe for his clients, he said. Under the house-arrest rules, they must report to the local police station up to four times a day. “That is totally excessive,” said Mr. Nogueras. “These measures threaten individual liberties. For most of them,” he said, “who have a normal work life, they can’t even work any longer. A spokeswoman said in a text message on Monday that about 200 weapons had been discovered during the searches along with 77 “discoveries of narcotics.” In the Paris region alone, 300 or so searches have been made, with more than 10,000 police officers deployed. In Lyon, France, a man with a rocket-launcher was arrested. What can go wrong, in the wave of searches washing across France, was vividly illustrated on Monday in the newspaper Le Monde, which detailed the hapless police raid on the restaurant in the Paris suburbs. Photographs from a surveillance camera posted online show police in full body armor and helmets, stiffly posing among bemused customers. On the Paris attacks and terrorism: Can Obama level with the people? The atrocities in Paris, killing more than 120 people, have brought forth the usual condemnations against terrorism and expressions of sympathy for the victims, but the larger question is whether this latest shock will finally force Western leaders to address the true root causes of the problem. Will President Barack Obama and other leaders finally level with the American people and the world about what the underlying reasons for this madness are? Will Obama explain how U.S. “allies” in the Middle East, such as Saudi Arabia, Turkey and Qatar, have been fueling this Sunni extremism for years? Will he dare recognize that Israeli repression of the Palestinians is a major contributing factor, too? On a practical level, will Obama finally release those 28 pages from the congressional 9/11 report that addressed evidence of Saudi support for the hijackers who attacked New York and Washington in 2001? Does he have the courage to explain how this scourge of Sunni terrorism can be traced back even further to the late 1970s when President Jimmy Carter started a small-scale covert operation in Afghanistan to destabilize a Moscow-backed secular regime in Kabul and that President Ronald Reagan then vastly expanded the program with the help of the Saudis, pouring in a total of $1 billion a year and giving rise to Saudi militant Osama bin Laden and Al Qaeda? Can Obama be convinced that telling hard truths to the American people is not only vital to a democratic Republic in a philosophical way but can have the practical effect of creating crucial public support for rational policies? Will he realize that propaganda schemes or “strategic communications” may be clever short-term tricks to manipulate the American people but they are ultimately counterproductive and dangerous? Will Obama finally take on Official Washington’s well-entrenched neoconservatives and their “liberal interventionist” junior varsity by challenging their innumerable false narratives? Will he pointedly blame the neocons and the liberal hawks, including those who run the editorial pages of The Washington Post and The New York Times, for the disastrous Iraq War? Will he take on the “deep state” dug in at the big-name think tanks, not just at neocon havens like the American Enterprise Institute but at the center-left Brookings Institution? Can the President muster the courage to ally himself with the American people, arming them with real information, so they can act like true citizens in a Republic rather than cattle being herded toward the slaughterhouse? Can he shake his own elitism or his fear of social ostracism to somehow become a true leader in his last year in office, rather than a timid follower of the prevailing “group think”? Just because the “important people” have fancy credentials and went to the “right” schools, doesn’t mean that they have any monopoly on wisdom. Indeed, in my nearly four decades covering Official Washington, these “smart” folks have been wrong a lot more than they have been right. A leader of historic dimensions recognizes that reality and takes on the know-it-alls. In this case, a leader who enlists the American public by giving them reliable information could change this depressing dynamic. Instead, Obama could twist the arms of his Saudi, Qatari and Turkish “friends” to get them to halt their financing and military support for Sunni jihadists associated with Al Qaeda and its various spin-offs, like the Islamic State and al-Nusra Front. And he could work cooperatively with Russian President Vladimir Putin to squeeze concessions out of both the Assad regime and the U.S.-financed “moderate” opposition so a unity government can begin to restore order in Syria and isolate the extremists. Once some security is achieved, the Syrian people could hold elections to decide their own future and pick their own leaders. That should not be the business of either Obama or Putin. As part of this effort, Obama could finally release the U.S. intelligence analyses on both jihadist funding and the circumstances surrounding the lethal sarin attack outside Damascus on Aug. 21, 2013, which the Obama administration hastily blamed on Assad’s regime although later evidence pointed toward a likely a provocation by Sunni extremists. To create crucial space for cooperating with Putin, Obama also could let the American people in on the reality about the Ukraine crisis in 2014, which was used by the neocons and liberal hawks to drive a wedge between Obama and Putin. U.S. intelligence analysts know a lot about key turning points in that conflict, including the Feb. 20, 2014 sniper attacks, which set the stage for ousting elected President Viktor Yanukovych two days later, and the July 17, 2014 shoot-down of Malaysia Airlines Flight 17, which was used to build an anti-Putin hysteria. I’m told that these tragedies became propaganda weapons to deploy against Assad, Yanukovych and Putin rather than horrific crimes that deserved serious investigation and accountability. But whatever the ultimate conclusion about who is to blame for these crimes, why has Obama withheld from the American people what U.S. intelligence analysts know about those three incidents? It was Obama, after all, who talked so much about “transparency” and trusting the American people as a candidate and during his first days in office. But since then, he has conformed to the elitist Orwellian approach of managing our perceptions rather than giving us the facts. Yet, if Obama could get his cooperation with Putin back on track – recognizing how useful it was in 2013 when Putin helped Obama get Assad to surrender all his chemical weapons and assisted in wresting important concessions from Iran about its nuclear program – then the two powers could also weigh in on securing a peace agreement between the Israelis and the Palestinians, another major irritant to peace in the region. Indeed, it appears that the possibility of Obama and Putin working together to force the Israelis to make meaningful concessions for peace was a factor in the neocon determination to turn an eminently manageable political dispute in Ukraine – over the pace of its integration into Europe without rending its ties to Russia – into the dangerous frontlines of a new Cold War. The neocons and liberal hawks outmaneuvered Obama who fell in line with the Putin-bashing, all the better to fit within Official Washington’s in-crowd. But the Paris tragedy is another reminder that it is well past time for Obama to resurrect his helpful relationship with Putin and restore the teamwork that held such promise toward settling conflicts through negotiations, along the lines of the Iran nuclear deal. If Obama were to choose that route – which could be implemented through a combination of truth-telling to the American people and pragmatic big-power diplomacy with Russia – he could at least start addressing the underlying causes of the violence tearing apart the Middle East and now spreading into Europe. Or will Obama’s reaction to the Paris attacks be just more of the same – more tough-guy talk about “resolve,” more “targeted” killings that slaughter many innocents as “collateral damage,” more tolerance of Saudi-Turkish-Qatari support for Sunni militants in Syria and elsewhere, more acceptance of hard-line Israeli repression of the Palestinians, more giving in to neocon/liberal-hawk demands for “regime change” in the neocons’ preferred list of countries? If the history of the past seven years is any guide, there’s little doubt which direction President Obama will choose. He will go with Official Washington’s flow; he’ll worry about what the editorialists at the Post and Times might think of him; he’ll accommodate the neocons and liberal hawks who remain influential inside his own administration. In short, he’ll continue down the road toward destruction. In The Al Qaeda Network: A New Framework For Defining The Enemy, Katherine Zimmerman of the American Enterprise Institute describes the terrorist groups affiliated to Al Qaeda. Zimmerman is seen as a leading expert on the Al Qaeda network, having testified about it to Congress and written about it for The Washington Post, the Weekly Standard, and the Huffington Post. 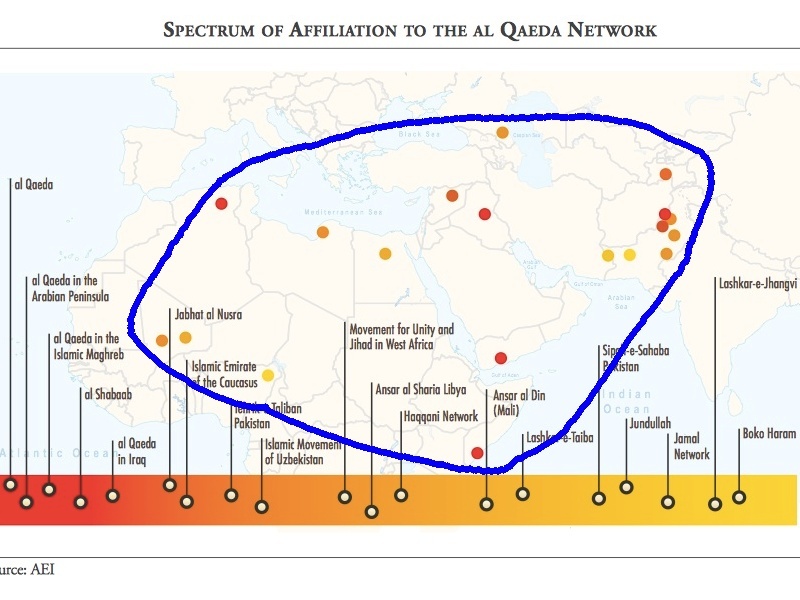 In her analysis, Zimmerman identified the geographical locations of the groups said to be within the Al Qaeda network. These locations outline an area encompassing parts of Northern Africa and all of the Middle East. This region, in which the entire Al Qaeda network is based, represents about 15% of the total land on planet earth. What is special about this land that might lead its inhabitants to a life of terrorism? Some, including Zimmerman, say that this region correlates to the land of Islam and that therefore the correlation is simply an indication that Muslims are prone to terrorism. However, the known distribution of the world’s population of Muslims does not support that contention. According to the Pew Research Center, only about 55% of the world’s Muslims live inside this al Qaeda network region. The other possibility is that this region is rich in resources and therefore powerful people have used claims of terrorism as a pretext to invade the region. That possibility definitely is supported by evidence. For example, ten years after the U.S. invasion of Iraq, U.S. officials began openly admitting that the war in Iraq was motivated by the desire to seize oil. U.S. military leaders including General John Abizaid, head of the U.S. military in Iraq, and Defense Secretary Chuck Hagel have said that the war was all about oil. Even former Federal Reserve Bank Chairman Alan Greenspan admitted it. Geographical correlation also supports this possibility much better. When the region outlined by Zimmerman’s Al Qaeda network is superimposed on a map of oil reserves by country, over 70% of the world’s oil reserves fall within the same region. If one considers only oil reserves that are not yet fully within the control of the world’s superpowers (the U.S., Russia, China, and the E.U. ), over 90% of what is left is within Zimmerman’s region. Only Venezuela, with 6.5% of the remaining oil, stands out. It is therefore not surprising that the U.S. government has recently declared Venezuela to be a national security threat. The strong correlation between Al Qaeda and oil suggests that the terrorist group might be better named Oil Qaeda. However, the truth is a little more complex. As reported before, the geopolitical significance of this small region of the world is as much about natural gas as it is about oil. Other critical resources, including lithium and gold, are motivators for those wanting control of the region. Moreover, it has been seen that the invasion of Afghanistan probably had something to do with that country having the ideal climate for the production of opium. Just before the U.S. invasion in 2001, the Taliban had essentially eradicated the production of opium in Afghanistan. Under the U.S. occupation, opium production has reached record levels and the country now supplies 90% of the world’s heroin. It’s clear that the Al Qaeda network is much more than it seems. For those who want simple answers, there will continue to be propaganda about the region’s problems with “Islamic terrorism.” For those who can still think and see, it continues to become clear that Al Qaeda and its associated network are merely excuses for seizing resources.